Limelight is another Daniel's condo community addition in the Square One Area. With condos on 4080 & 4090 Living Arts (Capital Towers), 1 & 33 Elm (City Centre Condos), 388 Prince Of Wales (One Park Tower), and recently finished 385 Prince of Wales (Chicago). Daniels' Corporation has been one of GTA's most successful condo developer. Developing distinctive condos such as the ARC (2881 Bayview), Festival Towers (80 John St), One Cole (1 & 25 Cole St), and Kilgour Estate (20 Burkebrook). 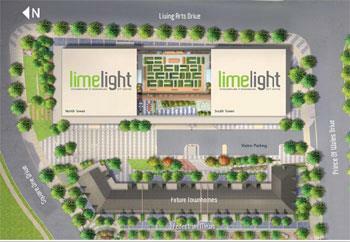 About Limelight: The Limelight will be located by Living Arts Drive and Prince of Wales. 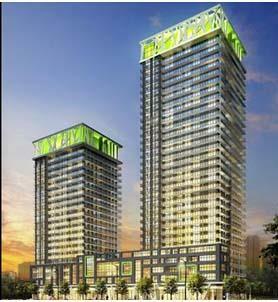 Located downtown Mississauga, this community is built around 3 acres of community park. Enter into a sophisticated 2 storey lobby at the Limelight. With Wi-Fi to surf the internet, and a flat screen projecting daily news. 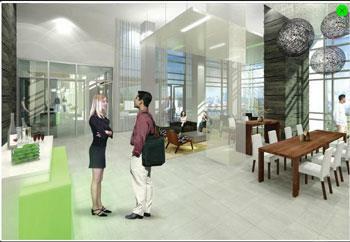 Amenities At Limelight: The 12,000 Square Feet Club Radiance will span through three floors. 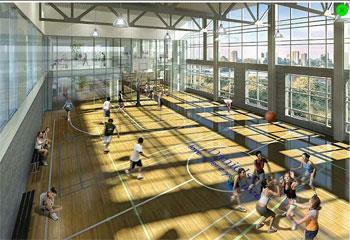 The Limelight is equipped with state of the art facilities including a workout floor on the third floor. On this floor residence will find a Basketball court and a fitness centre. Relax on the fourth floor. Surf the internet, or watch a sports game in the media lounge, or watch a movie in the home theatre room. Entertain your guests in the party room, BBQ area, and the outdoor living room. Unique Green Feature At Limelight: This unique green initative. On the 6th floor residents can take apart in doing their part to keep this building green. By planting trees and plants, the building is reducing their overall energy consumption and minimizing their carbon foot print. Location: Limelight will be located across the street from Square One Shopping Centre, walking distance to great restaurants, YMCA, Mississauga Central Library, theatres, shops, and the City Hall. Need to get down to Toronto? Easy Access To Highway 403, Cooksville GO, And Highway 401 and QEW is only minutes away. Limelight is located near the new Sherdian College Business School, which makes this an ideal investment. If you would like more information on the Limelight development or any other development in the GTA please give us a call 905-896-3333 or e-mail us below. Floor plans are also available upon request.